Mediated Spaces’ second offering was The Skymap, an application that used GPS-enabled mobile devices to display the current sky, planets, moon, constellations at the user’s current location. Our mission to help enable Citizen Scientists better participate and make a lasting difference in the community was strong. As amateur astronomy enthusiasts living in New York City, we were often visibly unable to see the stars above us at night. Light pollution within NYC was such that whenever we were outside of the city, the stars above seems that much more majestic, yet we could not accurately decipher our location by the stars. Astronomy has one of the largest followings of any of the sciences. It is also one of the few sciences in which Citizen Scientists still make significant contributions. Our process started with looking at the available applications within the marketplace as well as what advances in mobile technology could do to help solve our problem. We started our discussions with isolating the problem, working through user scenarios, whiteboarding out solutions and interaction models. We wanted to determine if we could build an app that users would want to use, let along could use. Working first with our Nokia phones, we developed prototypes for Symbian based phones. We knew that enabling users to find their location with their phone may be challenging in remote areas with low cell phone service and low light situations. The SkyMap helped amateur astronomers conveniently explore the current sky whenever and wherever they were, on their mobile device. The Skymap application was now available on the iPhone through uLocate’s WHERE™ application on top of the eighty other supported devices. 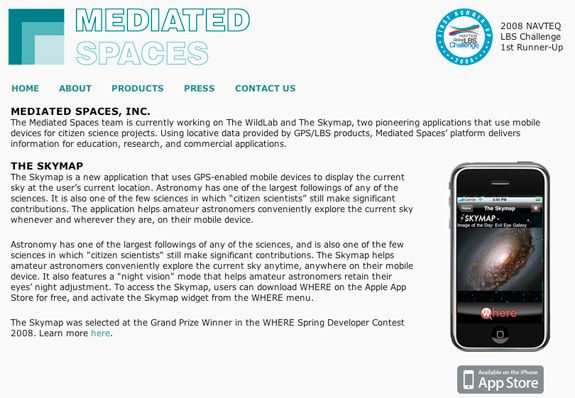 The Skymap used the uLocate’s WHERE™ platform for access to GPS functionality, and an interactive Skymap program to produce the current sky. To access the Skymap, users could download WHERE on the Apple App Store for free, and activate the Skymap widget from the WHERE menu. 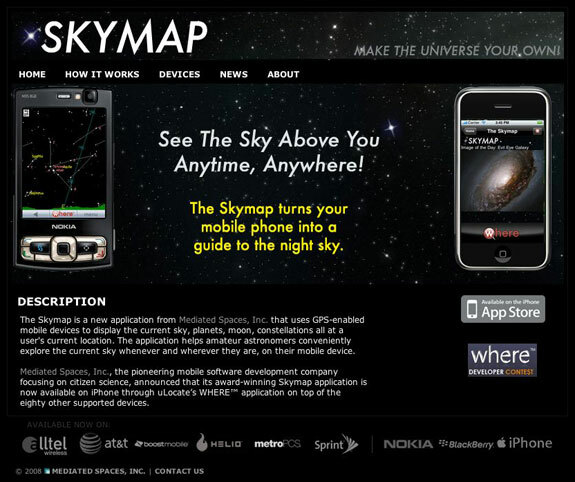 On the main page, users could select a direction (“azimuth”), and a horizon view of the sky would appear on the phone’s screen. The celestial map could be rotated in 45-degree increments; as the field of view itself was what an observer typically saw, about 45 degrees. The SkyMap also featured a “night vision” mode that helped amateur astronomers retain their eyes’ night adjustment. The Skymap was selected at the Grand Prize Winner in the WHERE Spring Developer Contest 2008.